Today we hiked Hetch Hetchy Dam. This dam was created in 1923 with the daming of Tuolumne River and began to deliver water to the San Francisco area in 1934. The creation of this dam is rumored to have contributed to the death of John Muir because he was so saddened by the loss of this beautiful valley. The valley is described as having natural beauty to rival Yosemite Valley. The Sierra Club still has a campaign to restore the valley to what it was like before the dam was created and open it back up to the public. As I walked along the water in the valley I too couldn’t help but mourn the loss of what would have been a gorgeous area to hike and camp in. Similar to Yosemite Valley, it has natural domes, huge and gorgeous waterfalls, and a river that would have run through its center. While draining the dam may be unrealistic at this point because it supplies water to such a huge area, as I hiked across the dam and looked across the filled in valley I could almost imagine what could have been had this area not been altered and, as a staunch conservationist, deeply regretted the loss of what should have been a protected area for the public to enjoy. 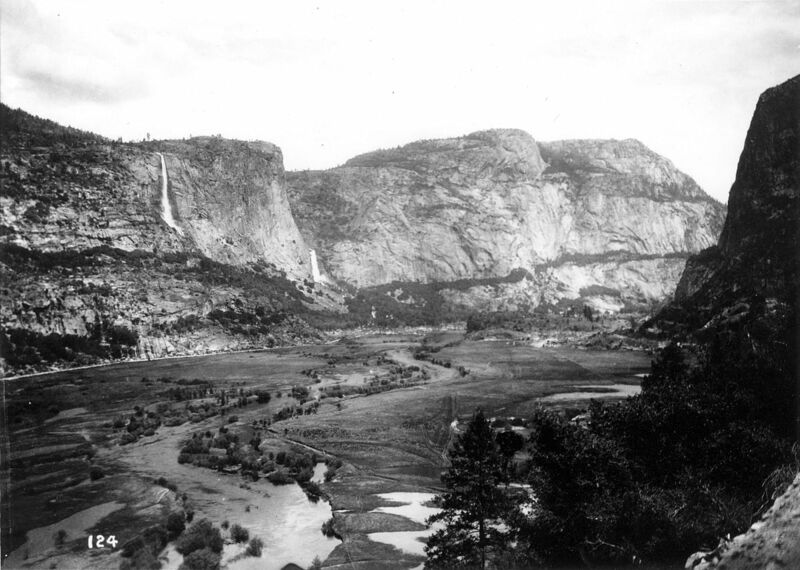 A photo of the valley before it was filled with water. Even though the area has been massively altered by the creation of the dam, the hike is still quite beautiful. The first step to the hike is walking across the dam itself. It is a stark contrast between the calm waters of the reservoir on one side and rapidly flowing water on the other side. From this point, you have a view across the whole valley. We went incredibly early in the morning, and the sun was rising above the valley so the pictures look a little discolored despite my efforts try every exposure and aperture setting on the camera. The pictures I took here don’t quite capture the natural beauty of this area. Next the hike walks along the water. It may have been a high year of rainfall when we went, but we were no more than 10-20 feet above the water for the next mile of the hike. It is fairly flat at this point with a wide trail where my dad and I were able to walk side by side. As with the rest of the hike, you occasionally catch panoramic views of the valley through the trees that line the trails. The next part of the hike is on uncovered rock that starts to go a lot steeper uphill and then back downhill. This pattern of uphill and downhill recurs a few times. If it wasn’t 8 am in the morning when we were doing this hike I would imagine that this would be uncomfortably hot because there’s no tree cover on this part of the hike. After a final uphill and then downhill push, you finally arrive at the waterfall. This waterfall must have been huge and beautiful before the dam existed. Even as is, it was still one of my favorite sites we saw this week. The waterfall sprays down in multiple separate places and mists off the rock forming little mini rainbows in every direction. The water from the falls actually gets the trail a little misty and it felt very refreshing after the hike it took to get there. The trail in this place is actually a long bridge and the water from the falls runs under the trail in places and into the reservoir. This waterfall is easily the best part of the hike. Overall, this hike was very easy, had some great views over the reservoir, and ended with a gorgeous waterfall. If you’re ever in this area, I would recommend it but I wouldn’t go out of my way to do this hike. It was nice, but it takes a long time to get there because the road is windy and narrow, and the entire time I could just imagine how the valley would have looked before it was filled in with water. It really is a tragedy what happened to this valley, and I can only hope that us humans are more thoughtful about using nature for our own gain in the future. The valley before it was filled with water. You can see the waterfall I have photos of as well as the river that used to run through the valley. This ended our trip to Yosemite. I had a great week with my dad and Shayna and we were already planning on next trip on the car ride home today. My friend, Shayna, left us to go home and see Hamilton this morning, but, after showing her the pictures, she was really bummed she missed this hike. Today we did the Gaylor Lakes Trail and it may have been one of the most beautiful places I have ever been. This hike is definitely one of the best kept secrets in Yosemite. There were maybe 15 other hikers we saw on the trail, and we were on this beautiful trail for four hours because it was just so pretty we didn’t want to leave. Four hours sounds like a long time, but the trail itself is actually quite short at about 4 miles long roundtrip and only has a 600 foot elevation. Like everything we have been doing in Yosemite, it is at a very high elevation and the start of the trailhead is already at 10,000 feet elevation. The trail is off of Tioga Pass, and so is open whenever that road is open (usually October-Septemberish). I would recommend bringing bug spray because you will be surrounded by lots of water and the mosquitos definitely came for me. I went home with over 30 bug bites! The hike starts at a decently steep incline up a trail that takes you through some trees and near a stream. It’s almost an uphill meadow because there’s a lot of grass but there’s also a lot of trees. This part of the hike had some gorgeous wildflowers decorating the trail. My dad and I were in no hurry to rush through and I kept stopping and taking picture of flowers. Eventually, the trail changes into more of a wooded area instead of a meadow, and then it crests up into an area that is straight rock that’s tinged red from all the iron in the ground. It’s a bit hard to describe because this trail would literally look like three or four separate hikes if you were to look at my pictures from the day. Once you get to this crest it completely changes scenery. Behind you, towards the valley, is all of Dana Meadow and it’s numerous ponds and streams stretching out before you. In front of you is a view of a gorgeous alpine lake and mountains in the background. The natural beauty of this place will take your breath away. As you can see, you have to climb down to the lake, and then the trail follows it closely on the side. Close enough to where at one point I squatted down and put my hand in the water because I was curious how cold it was. (It was very cold). There were lots of wildflowers here too just like earlier in the hike. The lake was a deep sapphire blue color and looking out over it on the trail had a postcard-type view of some of the tallest peaks in the park. You almost get the sense that you’re looking off the edge of the world. The next part of the hike feels like you are in the Sound of Music. The trail runs next to a stream up a grassy meadow. The path actually crosses over the stream a few times as it goes slightly uphill towards another lake. There’s a lot of wildflowers at this part of the hike too and the grass was incredibly green when we were there in late August. At the crest of the hill, you see another lake that is framed by a mountain. There was actually a large patch of snow when we were there, which was so strange to see because it was about 75 degrees out. The trail actually went across the snow, so my dad and I made some snowballs. After we had shuffled about 100 yards across the snow, the trail continued up a hill above the lake, The scenery completely changes here. The ground has much more iron here and it is a deep red color as you walk up the hill overlooking the lake. Once you reach the top of this hill, you see a partially fallen down house made out of slate. If you walk a little further, you can see two sunken in mines. In the early 1900’s, there were silver mines up here, but they collapsed after they went out of use when they didn’t prove fruitful. The partially built houses up on this hill are the houses of the miners who used to live there. It was super cool to walk up around here and imagine how these miners might have lived in this incredibly isolated area. It would have been beautiful, but lonely. This was definitely my favorite hike of the trip. It wasn’t the longest or the most well known, but it was incredibly beautiful and not very trafficked. Of all the hikes we did this week, this is the hike I would be most likely to do again and I would highly recommend it to anyone who finds themself on Tigoa Pass. I have wanted to hike Cloud’s Rest since I first learned about the hike a few years ago, and it was at the top of my list when we were planning this trip earlier in the summer. Cloud’s Rest is a 14.2 mile hike with about 1800 feet of elevation gain. From the top, it offers one of the sickest views of Half Dome in the park, along with views of Tenaya Lake, Mount Hoffman, North Dome, and so many other peaks that we could only begin to name when we pulled out our map. When we did the hike, it wasn’t terribly crowded, but there were other hikers on the trail. We did start pretty late in the day, around 10 AM, because we had hiked Pothole Dome first, so that may have made it seem like there were less hikers than if we had started the hike earlier in the day. This first couple miles of this hike are a flat nature walk through the Tenaya Lake Valley. It’s shaded and smells like trees and is generally very enjoyable. It sort of makes you think like hey, this hike might not be too bad (you are wrong of course). You also walk next to a river for parts of it, which is nice. Funny story time: I was using fairly new hiking shoes on this trip, and after we hiked Pothole Dome this morning, I spent about 15 minutes cutting up moleskin and bandaging my blistered feet. About 200 yards into the hike, there is a stream you have to ford and I just thought “oh no, now I have to stall our hike even longer”. I thought I was going to have to take the bandages off my feet, walk across the river, and then rebandage them. But, then my dad pulled through and won MVP of the trip when he carried me across this stream. Other hikers on the trail thought it was hilarious. After that pleasant nature walk where you’re tricked into thinking this hike will be a breeze (I should’ve known better, we were in Yosemite after all), you gain 1000 feet of elevation in a mile on a bunch of switchbacks. The only redeeming thing about this part of the hike was that parts of it were in the shade. It’s not quite Half Dome status, but its certainly not fun to gain this much elevation this quickly at such a high elevation. The next part of the hike was a pretty steep downhill for quite awhile (that you will feel on the way home) and then another nature stroll through some woods. There’s a small lake that you pass and a stream and lots and lots and lots of wildflowers. There were so so many lupins when we went, it looked like a fairy forest of lupins because at points they just blanketed the ground. There is a lot of water in this part of the hike, so there are also a lot of mosquitos. If you want to stop and take pictures, be prepared to be bitten. I ended up with 37 mosquito bites at the end of this trip (but don’t let that stop you from doing this hike, mosquitos really like my blood for some reason and my dad did not end up with that many bites). After that, you start your ascent up Cloud’s Rest itself. It’s definitely not as steep as the first climb of the hike, but it’s not a comfortable uphill either. The scenery at this part of the hike isn’t really that great, so we just powered through this part with few stops until we reached the peak. The peak of Cloud’s Rest is one of the coolest places I’ve ever been, but it was also terrifying for someone like me who has quite the fear of heights. On one of the sides of the peak is the furthest drop in the park. If you fell from here, you would fall around 5,000 feet. The way the peak looks is that it starts as a wide base, and then it gets really narrow as you get closer to the peak, and then once you make it to the top (where all the dope views are) it widens out again. The one thing I will say is to be very careful on that narrow part. If you trip, you’ll probably be fine, but a part of me felt like a strong gust of wind would just blow me off the face of the Earth. THE VIEWS FROM THE TOP ARE SOME OF THE COOLEST THINGS I’VE EVER SEEN. You get one of the best views of Half Dome in the park, and can see so many other peaks. Using a map, my dad and I found Mt. Hoffman, North Dome, Tenaya Lake, and various other peaks. Even with the fires that were happening while we were there, the views were still amazing. I can’t even imagine what it looks like from the top of this peak on a clear day. I highly recommend this hike and I would definitely do it again. Although it’s long, it’s not ridiculously difficult, and the views from the top are worth it. 10/10 would recommend. This is literally the coolest photo anyone has ever taken of me. Can’t beat Yosemite! Thanks for reading! Today, we hiked both Pothole Dome in Tuolumne Meadow and Cloud’s Rest, but in this post I’m going to focus specifically on Pothole Dome (mostly because Cloud’s Rest really does deserve it’s own separate post). Pothole Dome was about a 2-3 mile hike with only 300 feet of elevation gain (which a breeze compared to yesterday). Unlike some of the other hikes we did this week, I never felt like one misstep would mean near-immediate death, and it can be comforting to have that kind of security on a hike (especially when you are doing an abundance of near-immediate death hikes). When we went, the crowds were light. We did not see any other hikers on the dome; the few hikers who we passed were on the Tuolumne Meadow Loop. Fun fact about me: I am OBSESSED with meadows. There’s something about a field of grass and wildflowers in the middle of a forest that really makes me content. I could wander in meadows all day without seeing gaining any elevation and be perfectly happy. I also love taking photos of wildflowers, and meadows often provide many different kinds of flowers as well as many different kinds of lighting to experiment. Pothole Dome is on the west end of Tuolumne Meadow. It doesn’t have much of a trailhead, but there are a few spots you can pull into right off of Tioga Road. It’s easy to miss though, so make sure that you’re looking out for it. The beginning of the hike is just through the meadow and then it skirts around the edge of the dome. When we were there, there were lots of white and yellow wildflowers and the grasses were very tall and green. Finding the place where you actually start walking up the dome is a bit tricky. Basically, its when the trail curves left for the first time and when the trail curves left for the second time. You have to walk through a small patch of trees and then you just walk right up the rock. It is a bit strange to be walking up what feels like concrete in the middle of a wilderness, but that’s how you make it to the top. There’s not really a trail (although there were some markers when I went), but it flattens out at the top so you should know that you made it. It’s not particularly steep, but we were all breathing a bit harder by the time we reached the top. The view from the top is, like everything else in Yosemite, beautiful and varied and the type of view you could only find in Yosemite. You can see clear across the meadow all the way to Lembert Dome. The river snakes lazily through the meadow in wide curves that look fake from the height you’re at. Off in the other direction is Unicorn Peak which was till covered in snow. Facing the road is a massive face of granite that I don’t even think you can hike. For such a short hike, you get incredibly varied views in all directions. I would definitely do this hike again. It was short, easy, and had a big pay off at the top. Plus, you get to walk through a meadow, and meadows are the best. On this day of our trip we hiked lower and upper Yosemite falls, although I’m not sure I would call lower falls a hike so much as a nature walk on pavement. It’s a half mile loop there and back that’s really easy and mostly flat right up until you get to the viewing point of the falls. The falls, of course, are gorgeous. This is a great hike to do as a warm-up, if you don’t have that much time, or if you have someone with you who has limited mobility. We did it as a warm-up before our main event, which was hiking upper Yosemite falls. Warning – I would not recommend hiking upper falls unless you are a fairly experienced hiker and don’t mind lots of people on the trail with you. The trail is 7.2 miles round trip with 2,700 feet elevation gain. It’s a difficult hike, and, to be perfectly honest, the hike isn’t all that attractive until you make it close to the top. It was an alright hike, but it’s definitely something I only want to do once. The trail starts up a series of steep switchbacks that seem like they go on forever. The switchbacks are, however, in the shade because you are surrounded by trees. It makes it difficult to get a view of how far you have climbed up, but we welcomed the shade on the hot August day in which we made the hike. After you finally reach the top of what seems like endless switchbacks, you reach this plateau area where the trail is fairly flat, and there’s even some downhill (which is annoying on the way back). There’s some gorgeous views of the valley floor and half-dome and, when you go around the corner, you get your first view of Yosemite falls on the hike. This flat area of the trail leads to, you guessed it, more switchbacks! This is definitely the hardest part of the hike because the switchbacks are steep, long, and 100 percent in the blazing sun. You do, however, get some pretty sweet views of the valley floor as you climb. Coming from sea level straight into this hike I actually got a bit of altitude sickness. Just take it slow and remember to bring lots and lots of water! I won’t bore you with any more descriptions of the switchbacks. Just know that it was long and tiring and took a freaking long time to hike. Eventually, the switchbacks flatten out and you reach the top. I know you’ll probably want to stop here and never move your body again, but if you can garner up the energy, I would recommend walking the extra couple hundred yards up to the top. Here you get a view over the valley floor and of half dome. You can even look out over the waterfall which is awesome but a little freaky. Another route you can take at the top is to the bank of the river that tumbles into Yosemite Falls. We sat and ate our lunch next to the river. However, please please please do not wade into the water. It’s easy to forget when you’re sitting along the peaceful, slow moving river, but you are at the top of one of the tallest waterfalls in the world, so treat the river that runs into that waterfall with respect and caution. After a short rest and some lunch, we headed back down the trail. It was hot and dusty, but going downhill was significantly easier, and the sky was clearer of the smoke from the fire so we had a much better view of half dome and the valley floor on the way down. This hike was challenging with lots of awesome views. If nothing else, you get to stand on top of one of the tallest waterfalls in the world. So it is once again the best time of the year which is summer because that’s when I’m able to spend the most time in the outdoors. This year, my dad and I decided to take a summer trip to Yosemite because we both love the park and had a few big hikes we both wanted to do there. My friend Shayna is along for the ride too, but she’s left a day earlier than us because that loser has Hamilton tickets for the weekend. Anyways, the way we planned this trip was a bit different than many of our other trips. Instead of doing a big backpacking or camping trip, we decided to actually AirBnB a house about 40 minutes outside of the north entrance to the park because I needed to be able to put in my weekly 12-15 hours of studying for the LSAT and my dad was on-call for work. From this house, we drove to various hikes in the park such as Upper Yosemite Falls and Cloud’s Rest (and many more). When my dad first suggested this idea for the trip I was hesitant because I felt like it wasn’t “real hiking”, but it has actually been a very cool way to get an extremely varied experience of the park and still be comfortable in the evening. (Don’t worry though, we’re planning a “real” backpacking trip to Sequoia National Park next summer already). We got up the first morning bright and early and managed to make it out the door at around 7 am. The drive itself was very uneventful, and we made it to the entrance of the park around 1 pm. My dad had been told by a ranger that there was a half hour to an hour wait time just to get into the park but there was only one car in front of us so we didn’t have any problem. Since we got there much earlier than expected we decided to do a short hike in Tuolumne Grove to get ourselves acclimated to the higher elevation and kill some time before we could go to our Airbnb and because Sequoia trees are gorgeous and very large. Unlike many parts of Yosemite, there is a decent amount of close parking for this trailhead. We didn’t find a spot in the actual parking lot (of course), but we found a spot about a quarter mile down the road. I’m actually way happier we parked there than in the lot because the road ran through a meadow full of wildflowers and it was so pretty. (I also literally love meadows so much). The hike itself is real short and easy. The signs by the hike kept giving different lengths for the trail, but if I had to guess I’d say it was around 2.5 miles (so about 3 miles total for us from our car). You start walking downhill on an old fire road surrounded by trees (that are not sequoias at this point unfortunately). It gets pretty steep at parts, but the trail is wide and flat and parts of it are paved, so it’s easy to walk on. They can live up to 3,000 years old. While sequoias can grow up to 300 feet tall (that’s about the height of a 26 story building) they are mostly known for being massive in diameter and width. The largest tree by mass is a sequoia tree know as General Sherman (although the tallest is a coastal redwood but shhhhh sequoias are still cooler). The General Sherman tree is 2100 years old! Sequoias reproduce by seeds in cones, which require fire to release them from their pods. Sometimes seeds spend 20 years inside a pod before they are released. Their seeds are also tiny, there are about 91,000 of them in one pound. They are pretty much only found in 77 groves in Northern California, but there are some in Europe that were planted in the 19th century. They are incredibly resistant to fire and disease and could (probably) survive an apocalypse because they are so hardy. Anyways, back to the hike. One of the first sequoias you see is just massive. Here’s me and Shayna for scale. Another cool part of this hike is the tunnel tree. It was carved out as a tourist attraction in 1870. Here we are again for scale. (Don’t worry, they didn’t carve it out until after the tree was already dead). It has that double pronged top because it was hit by lightning at some point. The inside of the tree is very carved with people’s names and had almost a polished appearance because so many people have run their hands over it. Another cool attraction of this hike is a fallen over sequoia tree. You are able to see the underside of its massive root system and really get a sense of how tall these trees could grow because you get to walk next to it. The last part of the hike is just walking that mile back up the fire road. It can get pretty steep but, compared to most of my hikes, this one was really short. I would rate it on the easy to moderate scale. It’s certainly not flat, but it’s short and more than half of it is downhill or on mostly flat ground so it’s really not that bad. It didn’t offer those grand sweeping views of rock formations that Yosemite is so famous for, but Sequoias are just as beautiful in their own and I really did enjoy this short hike. After the hike, we made our way out of the park and went to a grocery store to pick up some food for lunch and dinner for the remainder of our trip. We got to the Airbnb, made dinner, and hung out, planned our day for tomorrow, and watched a movie (or, in my case, did LSAT problems) until bed time. Tomorrow we were planning on doing Bridal Veil Falls, Lower Yosemite Falls, and Upper Yosemite Falls. We woke up this morning bright and early to pack up our stuff for the last time during the trip. While I was looking forward to using some soap, I didn’t want to go back to the real world with internships and responsibilities (although I did miss my dog, I have included a photo for reference because I am obsessed with him and he is the best). It’s always nice to get away on vacation, and this one was even nicer because we were so isolated without cell service. After a last cup of that disgusting instant coffee, we made some final adjustments to our pack and we were off. My dad I snapped this cute picture as we were walking across the bridge out of the campsite for the last time. I think it might be the only picture from the trip we have together while wearing our packs. As I did for the whole trip, I had my trusty camera hanging around my neck. Tuolumne Meadows (aka where our car was parked) is about 6 miles from Glen Aulin. Not counting an uphill patch at the beginning, the hike is fairly flat. The trail goes up the river for the first part, then across some flatlands where you have to cross these huge patches of granite rock, then through some forest-y type scenery, then you get to soda spring, and then finally you walk through the meadow until you hit Tioga Road and you’re back to the start. Walking next to the river is definitely the most striking part of the hike. The water is pretty and often cascades down in larger and smaller waterfalls. It’s not quite as grand as waterfalls one sees in the valley, but still super pretty. The sound of the water is peaceful and it makes the air smell good in a way that only large amounts of fresh water can. This part is, unfortunately, mostly uphill, but walking next to the river makes it a million times better. We did stop quite a bit during this part though because we had to keep shedding layers as the day got warmer. Next we walked through across some giant patches of rock and through a forest. I didn’t get a ton of pictures of this part because I was trying very hard to navigate the rock because it’s not even and I was wearing a backpack that’s roughly the size of me. During the walk in the forest, I was chatting with my dad and then forgot to take pictures. I noticed during the trip that I tended to take the most photos in the beginning of the trail and at the end. My theory is basically that I only thought about taking photos when I wasn’t talking to someone (or when something extra pretty popped up but those are exceptional circumstances). In the morning we didn’t talk to each other because it was the morning and we weren’t fully functioning humans yet and at the end of hike we were tired and also not fully functioning humans. That’s something I need to work on next time I hike so I don’t miss out on photos during large chunks of the trails. as you can see, it was a steep trail! About 1.5 miles from where our car was parked, we hit Soda Springs and Lembert and Parson’s cabin. I didn’t good photos of either of these cabins, so I should probably explain them. Lembert’s cabin is essentially the ruins of the tiny cabin he lived in for 10 years or so as a hermit in High Valley (my kind of man to be honest). The cabin may also have been used as a spring house rather than a dwelling as it is built over some of the natural springs there, and his actual cabin was probably somewhere else (it’s not like the guy documented his life as he was a hermit). There’s not much left of it but a few walls of stone. Parson’s cabin was built by the Sierra Club in his memory. Parsons was on the Board of Directors for the Sierra Club, and the cabin was used as a meeting place when it was first built and is now used for educational demonstrations by park rangers. The area around the cabin is called Soda Springs, so named because the water in the springs is naturally carbonated. Geologists aren’t really sure why this phenomena occurs. It can be kind of interesting to stand over a spring and watch the bubbles come and pop to the surface (although I may have been so tired from sleeping in a tent all week that I reverted back to the mindset of a toddler and that’s why I found this entertaining). It wasn’t the most exciting part of the trip, but it did make me curious why no one can figure out why this happens. I also wanted to drink it, but my dad told me not to. The next part of the hike was one of my favorite parts of the trip. We got to walk on flat ground while looking at gorgeous views, which is a rare thing in Yosemite. We simultaneously got views of the Meadow (sometimes with water/mini lakes), the forest, and the mountains peeking up behind the trees. There were quite a few more hikes on this part of the trail because it is closer to the campground, but I’d gladly trade some isolation for some pretty views. It also never really gets that busy up in High Valley because it’s so deep into the park, so that’s not something I would worry about if I visit again. Karson went ahead of my dad and I during this part of the hike, but my feet were hurting so we just cruised and enjoyed the scenery for the last time before we had to head home. Eventually we made it to the road, and I think we were all bummed to be leaving but also ready to go home (we all smelled pretty rank at this point to be honest). On our way out, we (and by we I mean by father) started talking to a group of middle-aged women who live all over the country but meet once a year to get their friend group back together from college and go backpacking. I thought that this was an awesome way to stay in touch and stored it in my memory for later when my friends and I don’t all live in the same place. As we were walking along Tioga Road to get to where our car was parked, a lady surprised us by whipping open her van door and offering us a bag of vegetables. I know what you’re thinking, which is that we probably shouldn’t have taken a bag of food from a stranger in a van, but you’ve got to keep in mind that we hadn’t eaten anything fresh in 5 days. I have never been so freaking excited to eat raw broccoli in my entire life, and doubt I will ever be that excited to eat raw broccoli ever again. Raw vegetables and Lembert Dome what more could I want in life? After profusely thanking the vegetable lady and devouring the bag in about a minute, we finally made it to our car and headed home. On our way home we stopped at this super good pizza parlor and I got some ravioli and we ordered a pizza. It was a satisfying close to a wonderful trip. Despite the fact that we had hiked around 35 miles in 5 days, I went home feeling more relaxed and content than I had felt in a long while. I always find the John Muir can describe how I feel about nature much better than I ever could. Thank you so much for reading this series (if I haven’t bored you yet). Hopefully there will be more to come soon 🙂 Also, my dad and I are traveling to Yosemite again in August so stay tuned for stories about those adventures as well if you’re a Yosemite fan. If you’re sick of Yosemite, I should be talking about some hikes in and around SLO for the next few posts so you can look forward to those as well.